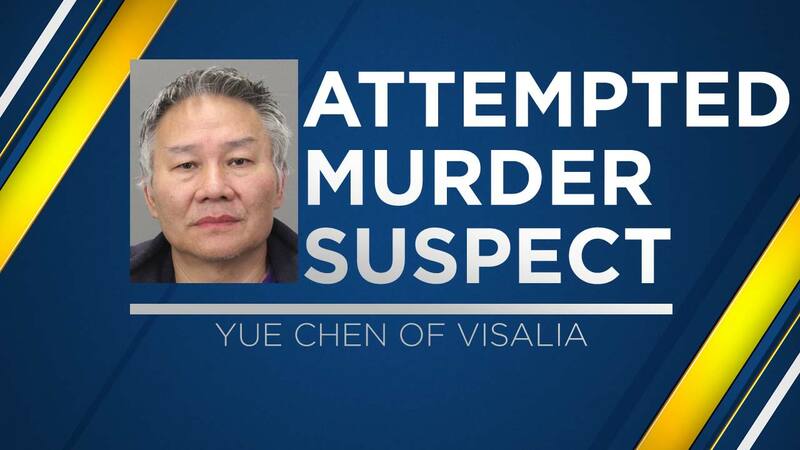 FRESNO, Calif. (KFSN) -- The Palo Alto Police Department said 58-year-old Yue Chen of Visalia had rented a car and traveled to the Bay Area with plans to kill his three doctors because he was upset about his treatment. On Wednesday, May 31st, the Visalia Police Department told the Palo Alto Police Department they were looking for Chen. They said he had rented a car and was now missing along with his two legally owned hand guns. Visalia Police told them they had found out that Chen was driving to the Bay Area with the intent to shoot three of his doctors at their homes because he was upset about his medical treatment. Just before 8 p.m. on Wednesday, CHP in San Jose saw the suspect's rental car and pulled him over. Officers say they found two loaded semi-automatic handguns with high-capacity magazines. Highway Patrol officers arrested Chen and took him to the hospital to get treatment for his medical condition. Once he was discharged, Palo Alto police booked him on three charges of attempted murder and carrying a loaded firearm.